Chief Arvol Looking Horse, 19th generation Keeper of the Sacred White Buffalo Calf Pipe. The leader of the Lakota Dakota Nakota Oyate, of the Sioux nation, speaks about the white buffalo legend (2010). Video Source: Youtube. Chief Arvol Looking Horse sees a great danger threatening "Grandmother Earth" and a great hope for restoring her wholeness. So he is calling all nations to prayer of any kind in an effort to return the planet to balance, the people to spirit. I asked him why this path is the right path to take. "A man or a woman without spirit is very dangerous," Looking Horse explained in a recent phone interview. According to this Sioux chief, the absence of spirit is causing suffering everywhere. "We are in a time of survival," he said. "But we don't want to believe it because we have forgotten our spirits. We have forgotten that Grandmother Earth has a spirit." Disconnected souls are hurting others without even knowing they are hurting others." Those being hurt include animals, trees and waterways. This image of a planet plundered by soulless people is poignant enough. But the additional appearance of a white calf at the turn of the Millennium is seen as a blessing and a warning: it hails a time of great change. As a result, there was enormous excitement when a non-albino white buffalo bull calf was born 12 May 2011 at Lakota Ranch in Greenville Texas. The calf was named Lightning Medicine Cloud. The Lakota are a proud people. Their 19th century leaders were so important in their struggle against the expansion of white man's America that they entered the popular mind in history and legend: Crazy Horse, Rain-in-the-Face, Sitting Bull. A descendant of Sitting Bull saw this calf as a reincarnation of Sitting Bull's spirit, a hope for all nations. Sitting Bull's successor describes the significance of the prophecy. Video Source: Youtube. It was horribly distressing, then, when the poor young Bison was found killed on 30 April 2012. Its mother died the next day. Rumours that the calf was skinned have been denied by local law enforcement. The Sheriff has declared the case closed, with the cause of death attributed to a bacterial infection (amid accusations of cover-ups). Others believe the case is an unsolved crime, now the concern of the Native American Rights Federation. 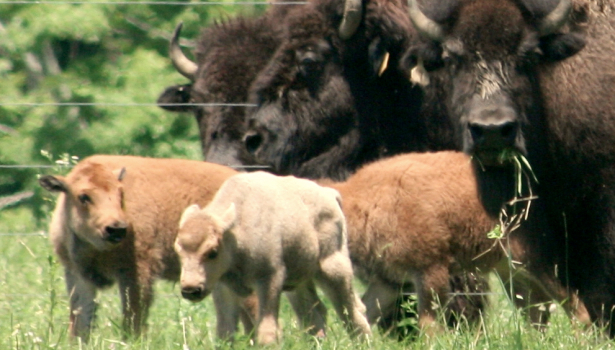 Whatever the cause of death, it seems this is a persistent omen, for another white buffalo calf was born 16 June 2012 at the Mohawk Bison Ranch owned by Peter Fay in northwestern Connecticut. This baby was named Yellow Medicine Dancing Boy. While recognized by visiting Lakota, this animal appears not to be seen in as potent terms. Perhaps this is because breeding lines can be manipulated to improve the chances of a white calf birth. It is implied, although not stated outright, that Native American owners would not play with breeding lines. Thus, there is a suggestion that a white calf born on a Native American ranch would be truly a gift of nature, not of research in genetics. Even so, this latter calf was named in a sacred ceremony on 28 July 2012, which was blessed by a big thunderstorm. Yellow Medicine Dancing Boy (centre) with his mother and other Buffalo. Image Source: Peter Fay via Indian Country Today. I live in Hunt County quite near to where the calf was born. It has been interesting to see the play of events surrounding both the birth and the death from different view points. Being a mutt of various cultures including 1/4 Native American, I have my own mingled view of the world and beliefs. I would say that I lean towards Mother Earth though. For me, this is an anxious time. My soul is filled with hope, projecting such positive intentions as I can out into the universe. The colder, more "logical" voice within me is skeptical and finds the big picture frightening. As a whole we seem to be a selfish race, an invasive species that destroys the earth beneath our feet and the skies above our heads. We drive out all other life, expecting it to conform not just to our needs, but to our wants as well. Even within our own species we turn a blind eye, one group gorging on wealth while another starves. The universe has given us a few minor shakeups over the past decade, but I'm not so sure we've carried much away from them. Perhaps we need to be swagger down and forced to struggle for survival as we are forcing so many others in order for our beautiful planet to once again thrive. We are just a tiny piece in an enormous organism. And we appear to be bent on destruction. It is my hope that we open our eyes and thrive while we still can. As always, I find great pleasure in your blog and appreciate the time and thought you place into each of your posts. I am in total agreement with you. There is a movie I watched within this past year that talks about the bees and I wish I could remember the name of it. I will look into it as I've told several people about it and am just having a brain freeze. It talks about several factors that are contributing to the disappearance of honey bees, including the pesticide you speak of. It is something that has bothered me for years now, as we have seen a change in the bee population that visits the few acres of our homestead, which is strictly organic, pesticide free and is purposefully planted with native plants many insects, birds, mammals, lizards, and amphibians take great joy in. Which delights me. Back to the point. I was shocked, but then again not so surprised by several practices mentioned in the movie. It would seem that several larger companies are as cruel to the bees they, I'll say "tend" though I'd rather say "torture", as supposed ranchers are to livestock. The disrespect of the very lives we consume so that we might live is a disgrace to our species in and of itself. correctly, the film speaks of how Europe had the same problems with their bees disappearing. I think it was France in particular. There was this specific pesticide group of two I think that they discovered was causing a mutation. (I could be slightly off here as there was a lot of information and it has been awhile.) They managed to get proof via filming the bees. Again, more detail within the movie which I will find the title for you. It will disgust you to no in. On the plus side of things, their government outlawed the use of those particular pesticides and within a year their honey bee population was once again thriving. That made me so happy to hear. On the downside, of course ours will not follow suit. To regulate big business to such an extent just isn't doable. Note the sarcasm. They have managed to block one form, but it isn't enough. Found it. The movie is a wonderful documentary from 2009 called "The Vanishing of the Bees". I'm thinking it has been over a year since I watched it after all. The last few have been a race, I tell you. If you by chance have not already seen this thought provoking film, I sincerely hope you are able to take something away from it. My first intimacy with a honey bee was around age 3 or 4. I stepped on one accidentally while helping out in my grandparent's garden barefooted. Their neighbor was a wonderfully kind beekeeper. Of course it was the most horrible of events to me at the time. As was the idea of allowing my grandmother to slather snuff on my foot. I was a grossed out child, but it did the trick. What I would give to see that amount of honey bees happily dancing about our yard. We do still have some fortunetly, but I'd say they number 1 for every 10 of the curious wood bees that frollick amongst the butterflies and hummingbird moths. I just read the article. You will definitely appreciate the documentary as it goes into more detail. And obviously since it was in 2009, these aren't new conclusions or ideas. It speaks of the shipping and feeding of the sugar and corn syrup as well as the horrid way in which colonies are manipulated via the artificial insamination of queens to the brutal murderer of them. Those specific companies have literally jacked with their life cycle. Plus the film shows the actual response of the Beeton the chemicals as two crops of sunflowers were filmed. Watching the two different takes between an organic sunflower and one with the particular agent on it broke my heart. You immediately see just how intensely it affects the bee. Of course you also learn where the company Bayer come from as well as a few other nice nuggets of information. I think with this reminder I am going to climb aboard my bandwagon and once again tell those I know about the film. Thank you. Thanks very much for your comment, Anon. I have not seen this documentary but found some trailers for it on youtube - will track it down. Colony collapse disorder is certainly one of many signs that policies in the 20th century had unforeseen consequences. In a funny way, the 20th century was sort of like the 19th century, except on a time delay in terms of real consequences. In the 19th century, critics could see the factories belching smoke and child labour and so on. But in the 20th century, superficial improvements in labour relations, marketing, transportation and communications made us miss the real dramas and real failures beneath the polished surface of progress. Fukushima was a ticking time bomb that ran for 40 years; there are other nuclear plants similarly on the edge of trouble. We have tested nuclear weapons, polluted much of the planet, have crumbling infrastructure; but because the standard of living for people rose significantly over the 20th century (despite warning signs in repeated recessions, which suggest that that level of mass consumption is unsustainable), most people did not notice what the real cost of that raised standard was. Global warming - ? A hyper-marketed policy joke compared to serious discussions we are not having about the wide-ranging problems that confront us, such as colony collapse disorder. Thus, while we must applaud modern advancements in science and technology, especially in the sphere of food production, we have to understand that all of those advancements have come at a cost. It is interesting that the signs are everywhere, screaming at you if you know where to look. But people are so overloaded with information and politicized and marketed messages that they can scarcely turn the volume down enough to live their lives and be barely productive in their jobs, let alone perceive any big picture. The impact of Nazi atrocities and experiments during the Holocaust on today's biomedical and other industries is a dirty secret not widely discussed. On bees: as a child, my parents knew a bee keeper who kept hives on our property. He used to pay them rent in the form of jars of honey and huge cakes of beeswax, 6" thick, 2' long, 1' wide. I still have some of these beeswax cakes wrapped in brown paper, still smells beautiful. They are something utterly real, an antidote for the fake-fake stuff that surrounds us.